(Nanowerk News) A University of New South Wales (UNSW)-led research team has encoded quantum information in silicon using simple electrical pulses for the first time, bringing the construction of affordable large-scale quantum computers one step closer to reality. Lead researcher, UNSW Associate Professor Andrea Morello from the School of Electrical Engineering and Telecommunications, said his team had successfully realised a new control method for future quantum computers. The findings were published today in the open-access journal Science Advances ("Electrically controlling single-spin qubits in a continuous microwave field"). 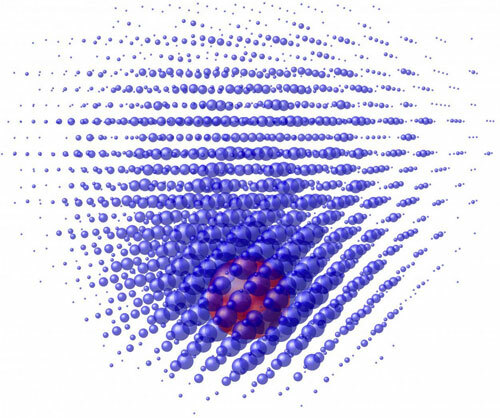 This is an electron wave in a phosphorus atom, distorted by a local electric field. "We demonstrated that a highly coherent qubit, like the spin of a single phosphorus atom in isotopically enriched silicon, can be controlled using electric fields, instead of using pulses of oscillating magnetic fields," explained UNSW's Dr Arne Laucht, post-doctoral researcher and lead author of the study. "This distortion at the atomic level has the effect of modifying the frequency at which the electron responds. "Therefore, we can selectively choose which qubit to operate. It's a bit like selecting which radio station we tune to, by turning a simple knob. Here, the 'knob' is the voltage applied to a small electrode placed above the atom." "This isotope is perfectly non-magnetic and, unlike those in naturally occurring silicon, does not disturb the quantum bit," Associate Professor Morello said.